It’s easy to forget that not everyone wants or can afford the latest fancy expensive smartphone from Apple, HTC, Blackberry etc. 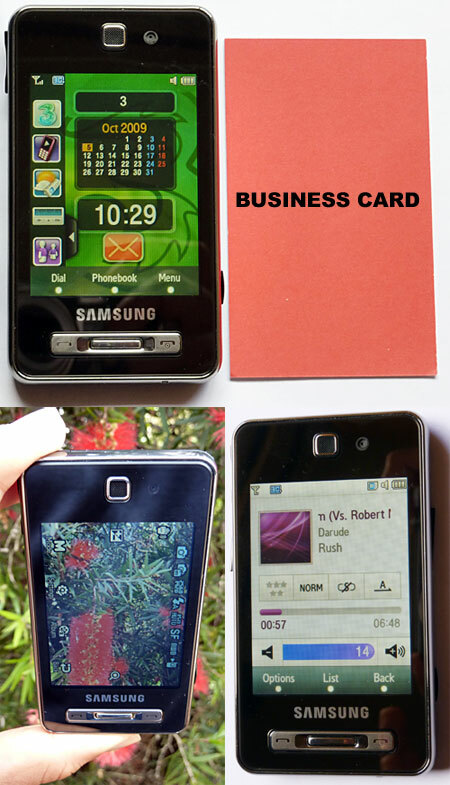 Which is why I asked 3 Mobile to lend me one of their popular mainstream phones, the Samsung F480 so I could review it. Available from 3 Mobile for free on a $29 cap, the F480 is touchscreen, almost as small as a business card, has a surprisingly fully featured 5mp camera with flash, a decent music player and a long lasting battery. Size & Looks: With the option of a black/silver or pink/silver brushed aluminum case the F480 looks great, at 98 x 55 x 11.6 mm it’s barely bigger than a business card and for a pleasant change unlike the smartphones I usually review the F480’s battery lasted several days even when used daily for phone calls/txting. Touchscreen: has been designed so the buttons eg: phone dialer are easy to press even if you have big fingers. 5 megapixel camera: At this price point the camera is the standout feature of this phone with 5MP quality, face detection, autofocus, image stabiliser, LED flash, Auto panorama stitching. Memory: 240 MB built-in plus the microSDHC memory card slot was tested successfully using a 16GB Sandisk MicroSDHC card. 3 Mobile TV – You can watch SBS, Cartoon Network, CNN, Sky News 24, Fox Sports News TV, Animax, Nickelodeon, Nick Jr, ABC Kids and Rage etc if you signup for a 3 Mobile TV pack. Radio and Music playback: Audio playback can be set to a quite loud level (upto volume level 14). Can play without headphones plugged in. You can play upto 16GB of music if you buy a MicroSDHC card. FM radio functionality is easy to use. Connectivity: Supports Bluetooth 2.0 and USB 2.0 but can’t connect to WiFi internet hotspots and doesn’t have a GPS to use for finding out where you are or the route you should take to driving/walking on Google Maps. Web Browsing: Not a pleasant experience. The screen is too small and the browser application not particularly user friendly. 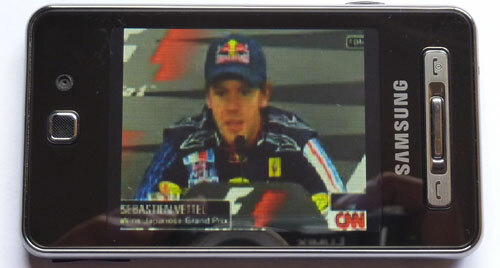 Video Playback: Similar quality to Youtube, requires videos to be re-encoded to 320×240 size so they can play on the screen. Screen / Display: Although 2.8 inches in size, the screen resolution is 240 x 320 pixels (half the size of an iPhone or other modern smartphone) and displays only 262,144 colours. While disappointing, keep in mind that this screen resolution is suited to the small physical size of the phone and helped to make it affordable. It’s not too often that we are so impressed with a handset as we are with Samsung F480. The little fella is an extremely capable device carrying a serious feature pack. In addition, it is so suave and compact that it is bound to earn itself quite a lot of fans … the F480 is targeted at people that want a good all-round device, which won’t tear a hole in their pocket. Samsung F480 will also be a tempting purchase for the cameraphone lovers. Offer[s] seemingly everything a mobile user could want, including an ‘almost’ large enough 2.8″ screen, a 5MP camera with facial recognition, haptic feedback for touchscreen vibrations, an FM radio, video player and Panorama shot maker. Is there a cable to plug into car stereo and play downloaded music ?